When: Tonight, 1/9/2010 at 7:05 p.m. The Penguins come into tonight’s matchup hoping to conclude their longest home stand of the season on a high note. On Friday night, they defeated the Lowell Devils by a score of 3-2. Dustin Jeffrey scored the game winning goal for his team leading 12th goal on the season. John Curry responded to a poor showing against Norfolk by securing his 16th win of the season. Much like their NHL affiliate earlier this season, WBS is also battling a case of the injury bug. Rookie Keven Veilleux is done for the season following shoulder surgery on December 29th. Forward Ryan Bayda was hoping to play this weekend after suffering a knee injury in Hershey on November 14th, but had a setback in practice and is instead projected to return next weekend. Going into tonight’s matchup, the Penguins’ record is 20-16-1-1, which gives them 42 points and a third place standing in the East Division. Once again, Dustin Jeffrey is the player the Monarchs should keep an eye out for. He has five points in four previous game and three of those points came in losing efforts to Hershey and Norfolk. Eric Tangradi struggled in the early part of the season, but could be finding his stride in the second half. He has scored a goal in the Penguins’ two previous games and added an assist along the way. He has 14 points on the season. 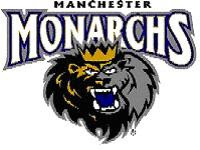 The Manchester Monarchs, the AHL affiliate of the Los Angeles Kings, saw a brief two game winning streak end on Friday with a 3-2 shootout loss against the Albany River Rats at Times Union Center. However, their record of 24-11-1-4 still has them in first place in the Atlantic Division and second in the Eastern Conference. Their overall home (15-4-0-2) and away (9-7-1-2) records are also the best in their division. The Monarchs second ranked penalty kill unit is sure to be a challenge for the Penguins if the home team gets a power play. Manchester has killed penalties an 87.7% rate this year. Although the Monarchs are one of the top conference and divisional teams this year, they do not have any skaters in the top part of the standings of the AHL’s overall scoring categories. Like the Penguins, Manchester is also dealing with multiple injuries. Shawn Bates, Justin Azevedo, and John Zeller are currently on injured reserve with lower body injuries. Thomas Hickey, Trevor Lewis, and Andrei Loktionov are dealing with upper body injuries. All with the exception of Bates have been on the injured reserve since November. Goaltender Jonathan Bernier is tied for second among AHL goalies with four shutouts on the season. He is ranked third with a .941 save percentage. Despite Friday’s shootout loss, he turned aside three of four Albany attempts in the shootout. Marc-Andre Cliché has three goals in the previous two games. He scored both goals in Manchester’s victory against the Springfield Falcons on Wednesday as well as a third period goal in Friday’s loss.